What: The focus of NOAA's field study includes airborne measurements using the NOAA WP-3D aircraft and a Twin Otter remote sensing LIDAR aircraft, and surface measurements using the R/V Ronald H. Brown mobile platform. Who: Investigators in this project include researchers from numerous universities, industries, and governmental agencies. Participating institutions include the Texas Commission on Environmental Quality (TCEQ), University of Texas at Austin, and Georgia Tech. 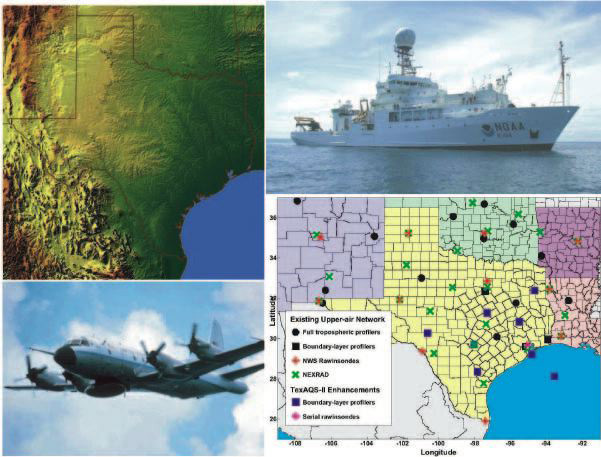 A follow up to the project in 2000, this research effort was designed to improve understanding of the factors that control the formation and transport of air pollutants along the Gulf Coast of southeastern Texas.